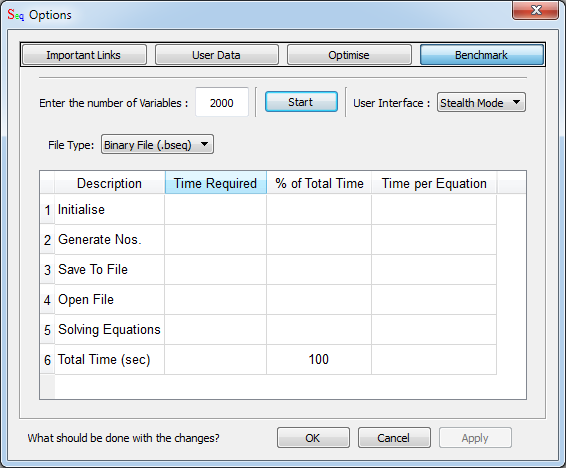 Sequalator: How to perform Sequalator benchmarks? 2. Go to User Data -> Main Window. Now disable Hardware Acceleration using OpenCL and press OK and again press OK if the confirmation dialog appears. 3. Again open the Options dialog and press the Benchmark button. Enter the no of variables as 2000. Set the User Interface to Stealth Mode. Select the File type as Binary File. Now press Start! 4. After the benchmark is complete, Sequalator will ask if you want to save the benchmark file. If you want to have a copy of the equations used for performing the benchmark then press Yes; otherwise press No. 5. Now take a screenshot of the Options dialog and save it to a file. The best way to do this is by pressing Alt + Print Screen buttons simultaneously. Open MS Paint -> Ctrl + V -> Crop -> Ctrl + S (Select the file format as PNG). 6. Press the User Data button and enable Hardware Acceleration using OpenCL (disabled in step 2). Press OK to close the Options dialog. NOTE: If your PC does not have a GPU or if the OpenCL drivers are missing you may not get this dialog at all. If so, then your benchmark is almost complete. Go to step 9. Otherwise save a screenshot of this dialog to a file. 8. Select the device no 1 and press OK. This will perform computations on the corresponding device. When the benchmark is complete take a screenshot of the results. You may want to repeat this step until you get benchmark results for all the listed devices sequentially. 9. You now have all the screenshot files ready to upload. Just go to the Sequalator discussions group. Press the New Topic button. Make the subject of the discussion Sequalator Benchmarks by your name. Add details as per this format. After adding all the required details submit the topic. 10. You will be notified after your benchmark is reviewed. Feel free to ask queries in the comments section below.